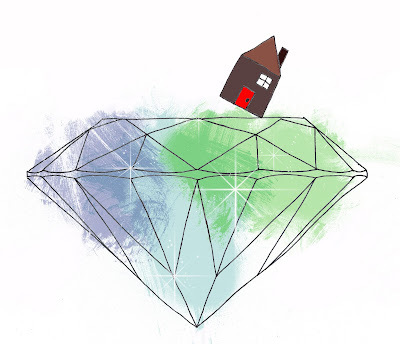 Diamonds are forever . . . . and so are mortgages. It's come to my attention that despite my constant effort to remain infantile, I'm growing up. And buy 'growing up' I mean I'm still far too dependant on my parents but am becoming increasingly (and somewhat disturbingly) comfortable without the presence of a consistent male in my life. And by presence, I mean the financial and domestic aid of a male, you know, like women had in the 50's. Women back then had someone (read: a husband) to pick up the marshmallows for the ambrosia or to tie their apron strings. I however find myself in the bitter reality of the 21st century, and for things like buying a home or say diamonds, I'm relying on myself. I'm not the only one either, the same goes for for a handful of other girls too. For those of you who are paying attention, I bought an apartment in the summer. A few days ago I unwittingly bought diamonds. Yeah, with all that spare cash I have from missed mortgage payments, and unpaid cable bills. Actually I got a bit of money for my birthday. And despite my better judgement, which was to save for the aforementioned bills etc. my Mum who has an equally materialistic personality, and a penchant for pretty and useless things, urged me to get something nice. That something nice was a ring in my favorite shop that I've had my eye on for about a year. It wasn't going to buy itself. I was chatting with said shop's proprietor, and asked if the twinkly bits in the ring were crystal. She said, "diamonds actually." This was when the gears began turning, and I started tallying my independent female friends. Friends that have (even if some of us are unemployed) accomplished things that up until recently we'd have needed a fella to help us with. Despite being a little sad that ones first diamonds and house are a single venture, I guess it could be worse. The silver lining is that I'm not "expecting" and/or divorced. To sum up: I'm proud of my friends for the things they do (careers), chances they take (relationships) and crap they've bought (homes). So way to go us! Well, it's February 14th in a few painfully quick hours, so I guess I should get a move on and buy myself a frilly pink heart shaped box of chocolates. Siiiiiiiiiiigh* Tune in next week when I have a nasty case of diabetes and acne.